Most moms can probably relate when I say that school supply shopping gets less and less exciting each year and more and more of a burden. The older your kids get and the more kids you have in school the harder it is to keep track of who needs what. It’s a full day chore around here to divvy up the supplies once I’ve finally gotten around to buying the things. True, it probably doesn’t help that I keep procrastinating by getting another cup of coffee or stopping to make cookies for an afternoon break, but still. It takes way too long. And I have a confession to make. I’m pretty much just phoning it in at this point. So I’ll let you in on a few secrets of mine. Maybe they can help you as well. Or at least, if my suggestions aren’t helpful, perhaps they can give you a laugh or two. Colored Pencils: We have 96 colored pencils in this house. At least. Probably more floating around under beds and in the attic insulation. I know, because I counted them all when I was supposed to be divvying up the school supplies. Suddenly counting colored pencils was of utmost importance. So knowing we had 96 of these things meant there was no way I was buying more just so the kids could have new ones. I sorted them out in piles for each kid. Some are Crayola, some are Rose Art, and some are Academix, whatever that is. They don’t match at all, but the kids have all the colors they need. I sharpened them all to a nice point so if you don’t notice the two-inch difference between the shortest and longest pencil or the fact that some are circular while others are hexagon shaped, you just might be fooled into thinking they’re brand new. Pencils: None of my kids have Ticonderoga pencils, no matter what the official list says. The generic #2 pencils cost half as much for twice as many, so I’m going with el cheapo brand. Markers: We don’t have as many markers as we do colored pencils, but we have enough for all three kids to take an 8-piece set. The thing is that some of our markers are dried out from losing caps, so finding an entire set is somewhat of a challenge. I had two sets of black-barreled Crayola markers, and for the life of me couldn’t find a matching green marker anywhere. So my boys both got 7 black-barreled Crayola markers and one white-barreled one. It’s blatantly obvious that they don’t have a matching set, but they have working markers so that’s good enough for me. 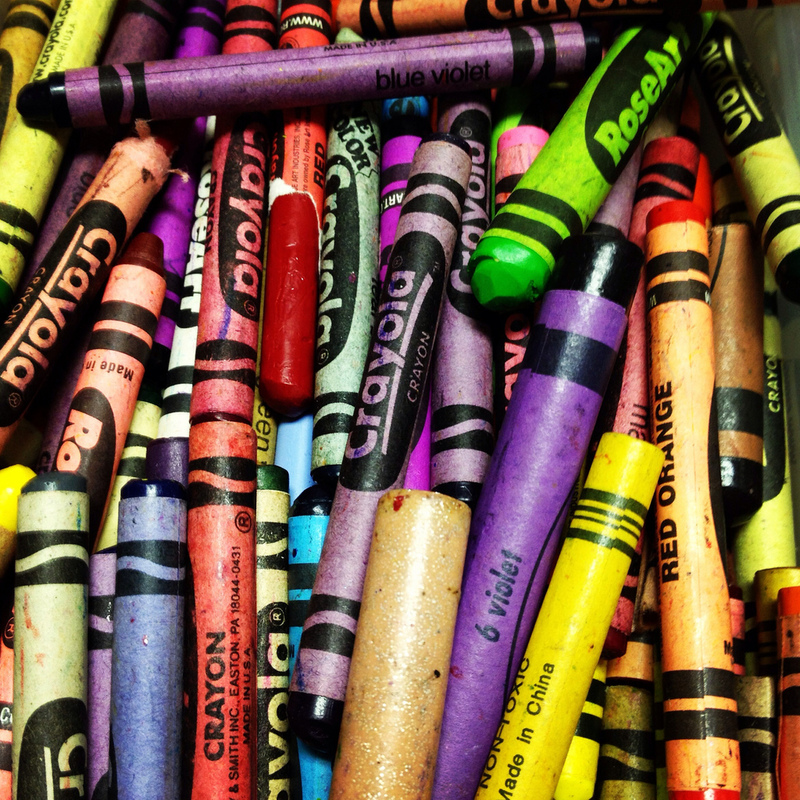 Crayons: Like the colored pencils and markers, we have a plethora of these things all over our house. So I simply dump them all out on the kitchen table and sort them into “close enough” colors. They may not get “burnt sienna,” but they’ll have some shade of brown that’s close enough. Glue: We have tons of glue around this house. Half used glue sticks, bottles that are partly empty… I send half used glue sticks with the kids so they can use them up. I figure one day they’ll come home with a note saying they need a new glue stick, at which point I’ll grab another couple of half used ones to send back with them. And I’ll even pour glue from one half empty bottle into another to make one full bottle. Despite the fading label on the bottle and the crusty glue on the orange dispenser, it could be practically new. Folders: I confiscate folders at the end of the school year and keep them hidden away until back to school time. Then I pull the used folders out and use those first before buying new ones. This year I already had more than half the folders my kids needed, which is pretty good considering some of them from last year were unusable even according to my low standards. Each kid got at least one new folder and one used one, so there’s a nice balance there. Fellow parents, do you see yourselves in here at all? If so, take heart. You aren’t alone. You’re doing a good job keeping track of everything. Parenting is tough work, and coordinating everyone’s needs and schedules requires extraordinary effort. Do the best you can and give yourself a break when you’re tempted to believe you’re failing. Relax your standards so you aren’t driving yourself crazy trying to live up to your own standards. Your kids will get by even if they have mismatched crayons. I love this! Think of it as teaching your kids good stewardship. I found myself “right there with you” , even if my children balked at the idea of mismatched stuff. Then of course there are the years that you just don’t even have time for that, so you break down and buy new crayons and markers because it was easier…..this was one of those years!